CHICAGO, IL. Like most of the season, at game’s end, the Force gathered in a tight circle at the fifty yard line to go over the day’s results. This outcome was much harder to swallow. The Force and the Detroit Demolition, just like their previous meeting, battled to a scoreless first half. 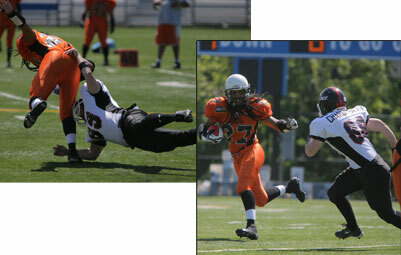 When the final horn sounded on the 2007 season, the Demolition made the most of Force mistakes and went on to a 21-6 victory, denying the Force a trip to the post season for the first time since they joined the IWFL in 2003. The pain and disappointment (along with a few tears) was written on the faces of the player’s and coaching staff. "They didn’t earn this, we gave it to them," said Coach Rich Bradford. In front of a capacity home crowd, no one could ever accuse the Force of taking a play off or losing focus. But there are no moral victories. The missed opportunities continue to plague this young team. The Demolition weren’t able to move the ball against the swarming Force defense, led by game day defensive MVP Tricia Charbonneau, and her mates, Jennifer Dulski, Shelley Picha, Becky Thuestad, Linda Bache, Tashaunda Shumpert, Luella Gesky, and Ericka Bell-Coleman. In the first two quarters of play the offensive line headed by game day offensive MVP Jessica McPeake, gave QB Sami Grisafe the opportunity to mix things up. Blending the running game with timely passing worked, as the Force marched down the field and had three chances in the red zone to score. Unfortunately they couldn’t convert. "You can’t give away chances against a good team like this," said Coach Rich Rio. "It will catch up with you." At the start of the third quarter, the Force fumbled on their first offensive series at the 32 yard line. Four plays later the Demolition made them pay with an 11 yard touchdown run. With 8:43 left to play, the Force mishandled a Demolition punt that Detroit capitalized on for the deciding score. The Force got on the scoreboard late in the fourth quarter when Grisafe found rookie receiver Diane Didier at midfield. Didier did the rest, cutting left and sprinting down the sideline to cap off a 70 yard TD reception. "We came up short today," said Head Coach Jim Stahl. "We need to continue to work hard and stay together as a unit in order to get over the hump."